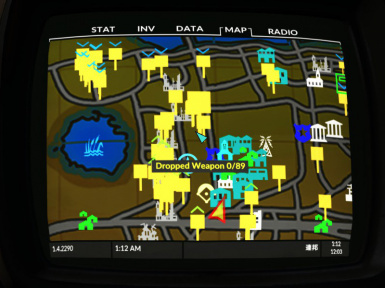 This mod helps to clean up the weapons that enemy have dropped. After installing, you will get the ring "Dropped Weapon Detecting Ring" and the holotepe "Dropped Weapon Detecting Program" automatically in game. If you couldn't get or lost these items, you can craft at Chemistry stations. When you want to clean up the cells around the sole survivor, equip the ring. 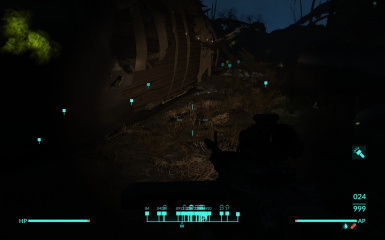 After equiping, the quest "Dropped Weapon : Ring" is displayed under the section "Miscellaneous" of the Pip-Boy. When you activate this quest, a quest marker is displayed on dropped weapon. Pick up a dropped weapon with the help of a marker, untill you are satisfied. After cleaning, unequip the ring. And travel the other place to clean up. When you want to clean up, load the holotape into the Pip-Boy or terminals. After loading, you will be able to show following menus. And you can command some tasks. Detection range is proportional to "uGridsToLoad(Fallout4Custom.ini)". When you can't see a weapon under a marker, its weapon dived to the ground. To solve this case, you need to use console command "tcl" or [Transfer to ~]. The commands [Transfer to Companion] and [Transfer to Dogmeat] are displayed only when they accompany you. Transfering works well in Vanilla, but I don't know whether or not it works well with Companion MOD. Max value of quest marker is about 50. 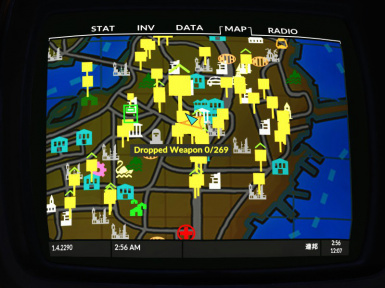 To detect weapons placed initially. To detect weapons placed on a Gun Brace. To detect weapons displayed on a Weapon Rack(DLC04"Contraptions Workshop"). 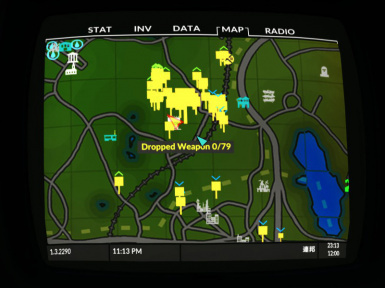 Once in a while, a quest marker is displayed on the Player in map. Download with NMM and activate. Unequip "Dropped Weapon Detecting Ring" and stop "Dropped Weapon Detecting Program" in game. And then after that, save and exit. 0.5.1 2016/07/12 Improve effect shader. 0.5 2016/07/09 The ring and the holotape can be used in combination. 0.4 2016/07/03 Display number of weapons in quest objective. 0.3 2016/07/01 Add holotape version. 0.2 2016/06/26 Fix the problem of quest logs that continue to remain.